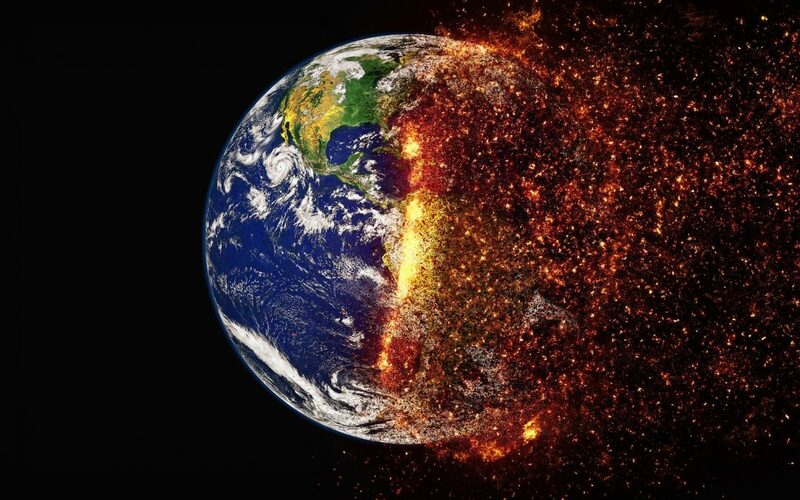 These five global climate trends are proof positive that not only has our planet’s atmosphere has changed as a result, but the world we live in has been irrevocably damaged. Global climate change is everywhere. In newspaper headlines, stand-up acts, on your mind. And, in all honesty, it should be. Global climate change is real, folks, and ignoring it isn't going to make it less real or less destructive. And no, the fact that it snows sometimes doesn't mean that it's not happening, and yes, no matter where you call home, global climate change is coming for you. It's a pretty bleak picture, right? Global climate change and the worldwide effects that come with can be pretty unnerving, but the more information you have, the less scary it might be. Well, first, you'll be able to respectfully and truthfully convince all those climate change deniers of its reality. And that's not just going to make you feel better; it's going to help everyone get on the same page. Because if we all agree about what's going on based on scientific evidence, global trends, and data, we can start doing something about it. While global climate change is a very real thing, it doesn't have to be the last word on the subject. Don't let the fear mongers get you down: know the truth about global climate change, do your part to spread the news, and, most importantly, find out what you can do about it. You don't have to be a scientist, climatologist, or meteorologist to see the signs of global climate change. They're everywhere: in the oceans, in weather patterns, and even in the air you're breathing right now. Global climate change is real, and there are five major signs and trends that are easy to see, no matter your level of weather know-how. And no, this won't make for better surfing or lower priced beachfront property. Over the past century, sea levels have been rising. And even more recently, sea levels have been rising at previously unheard of rates. In 2014, the global sea level was 2.3 inches higher than the average in 1993 -- the highest average ever seen. The global seas are currently raising at about 1/8th of an inch per year, and that's not a good thing. But why? And how is any of this connected to global climate change? Well, when the air warms up (caused by global climate change and the increased warming of our planet), the water warms up, too. This by itself causes higher sea levels, but that's not all. The higher temperature of the air and water causes glaciers and icebergs to melt, adding volume to the world's already rising seas. Rising sea levels caused by global climate change are a super serious concern, especially for the 40% of Americans living in coastal cities. Around the world, massive cities like New York and Shanghai could be submerged if the oceans keep rising -- even if they're not completely overtaken by water, massive flooding causes fatalities, injuries, home destruction, and a host of other issues that will leave millions of people in danger. Eight of the world's ten largest cities are near an ocean, so a huge chunk of the world's population stands to be drastically affected by rising sea levels, and it might affect you, too, even if you're sitting pretty in the plains. Massive flooding that destroys homes and water sources could drastically increase the number of refugees worldwide in addition to destroying the economies of states, countries, and cities that depend on tourism to beachfront sites. Homes aren't the only things that will be damaged in the wake of serious flooding. Water sources will likely be contaminated by seawater on a more regular basis, making fresh water sources an even bigger concern than it already is. Higher water levels also increase the likelihood of major hurricanes and water-based storms. Think Hurricane Sandy-level storms. Frequently. With higher ocean levels, flooding, and compromised fresh water sources, the potential for water-borne disease outbreaks increases exponentially. Diseases like cholera and basic diarrhea have aren't deadly in developed countries would increase in a world where clean water for drinking and sanitation are hard to come by, leading to all sorts of other problems like border wars and conflicts over fresh water rights. When you think “global climate change,” you probably think of hot temperatures, right? One of the major signs of global climate change is rising temperatures across the globe. Since 1880, the overall temperature has risen by 1.6 degrees Fahrenheit. It may not sound like much, but it for sure is. And as the temperature rises, you're not just going to be able to bask in the sun all day. In fact, some of the consequences of higher temperatures may keep you from venturing outside much at all. It's not just sunburn that will keep you inside. Increased heat (and fewer cold snaps) leads to more mosquitoes, more fires, and more death. The mosquitoes, who didn't die in the frost, may start living and thriving in new, unfamiliar areas. And this doesn't just mean that anti-itch cream sales will skyrocket. Mosquitoes bring with them a host of issues, and bug bites will probably be the least of your worries. Mosquito-transmitted illnesses, like malaria, may see a recurrence in areas that have never had to worry about such things before. Wildfires also love the heat, and the wildfire season in the western US has already increased, as have the length and intensity of heat waves. Heat also causes droughts and the likelihood of extreme weather events, like flooding, hurricanes, and major precipitation events. And it's all connected. Increased temperatures lead to melting ice caps and glaciers, which leads to higher sea levels, which leads to flooding and all of the other terrible things associated with high water. It's never just one bad thing. Rising water levels aren't the only problem with hot ocean water. When the oceans get hotter (because the air temperature is hotter), all sorts of living things suffer, not just the families whose homes were destroyed in the floods or the polar bears who live on the melted icebergs. It doesn't take much for the delicate balance of marine life to be upended and destroyed. As the oceans get hotter, underwater ecosystems and marine life are destroyed. Coral reefs are bleached and destroyed, and untold numbers of fish and marine animal species lose their breeding grounds. And this isn't just a prediction. Over the past 100 years, the average temperature of the water at the bottom of the ocean has risen by 0.13 degrees Celsius each decade. Warming of ocean waters causes more problems for ocean animals than making their homes a bit warmer, though. It literally makes it difficult and sometimes impossible for them to live. When the water gets hot, oxygen dissolves in the water (it's called deoxygenation), leaving little to no oxygen for the plants and animals in the water. This causes dead zones where nothing can live. Humidity has been an unfortunate side effect of summers and warm temperatures in varying locations throughout the world, but with global climate change, levels of humidity are increasing everywhere. Humidity isn't just uncomfortable; it makes it difficult and dangerous for people to work, travel, or be outside at all. Scientists predict that if global climate change keeps going the way, it is right now, by 2100, the world could reach new and awful levels of humidity, making outdoor activities and work new levels of awful and deadly. They're predicting that the heat combined with the humidity will lead to temperatures that feel like 170 degrees Fahrenheit. So many of the signs of global climate change lie in the ocean, and dangerous CO2 levels are no exception. Ocean CO2 levels have risen from 280 ppm to 410 ppm, which is a pretty bad sign. High levels of CO2 don't only make it rough for the fish and coral reefs. CO2 levels drastically affect the type of precipitation the land gets, which can cause droughts and floods and all sorts of extreme temperatures and precipitation events. CO2 levels especially cause droughts, because precipitation falls as rain instead of snow. This throws off agricultural schedules that rely on snowmelt instead of flooding rainwater, which could, in turn, affect food production as well as clean water availability. A Light at the End of the Global Climate Change Tunnel? That all sounds pretty bad, right? It's too hot; it's too humid, it's going to hurricane forever. And, really, given the facts, that looks to be where we're headed. Global climate change is real, and unless we do something pretty big, it's not going to get better on its own. But hope is not lost. There are some easy steps (and some difficult steps) that you, your family, and your friends can take to do your part in reducing global climate change. Plants (on land and in the ocean) are super important to the world. Not only do they provide homes for animals and look nice outside your window—they remove CO2 from the air and turn it into oxygen. Super helpful and underrated. If you're in a place where you can grow some trees, you're not only providing shade and oxygen; you're helping the ground beneath your feet stay stable in case of a mudslide or a flood. Deforestation is contributing to the destruction floods cause, so help yourself, and your home stay on solid ground. You can also grow your own food, which not only helps because you're planting plants, it decreases the amount of food you'll need to buy at the grocery store. The food you're buying probably is shipped from somewhere else in the first place, so the less outside food you need to buy, the fewer emissions from vehicles you're causing by buying food from around the world. Choose public transportation when you can. Walk places. Buy a hybrid or electric car. Don't let your gas-guzzler sit running while you wait for your food or while you wait for it to get warm. The less you run your car, the fewer dangerous toxins are being released into the air. Global climate change is happening. That's not in question. The real question is, what are you doing to help? Take a minute to really consider your carbon footprint and what you can do, change, or get rid of to help our world. The planet will feel better, and you'll feel better, too.